A picture says more than a thousand words. Personally I feel that eco art should play a much stronger role in getting our urgent environmental message across than currently happens in our country. Our future demands that – our hearts need to be stirred by all means possible. Why are our musicians not taking up the cause, the artist illustrating our problems, the poets not writing more about our earth in peril? The role of art in social commentary is very close to my heart and we simply cannot rely on the scientists to communicate the facts in their often dry and technical ways. We need to speak to the creative, spiritual side of our nation too to stir the pot so that we can help brew a future of awareness, compassion and mindful living. Celebrating the Soul of our Ecosystem is an art exhibition with a mission to help save our threatened rhinos. 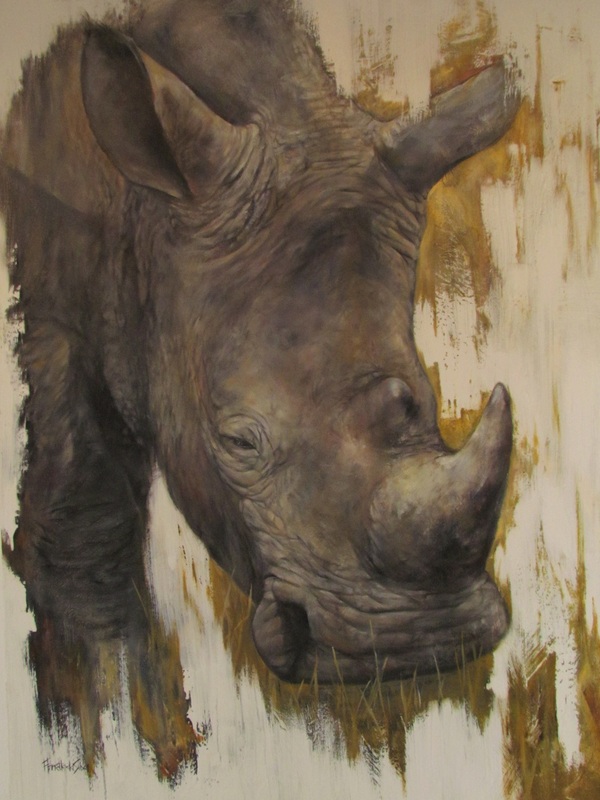 In the light of the devastating rhino massacre a group of artists gathered at the Oude Libertas Art Museum, Stellenbosch, to speak up through their art. 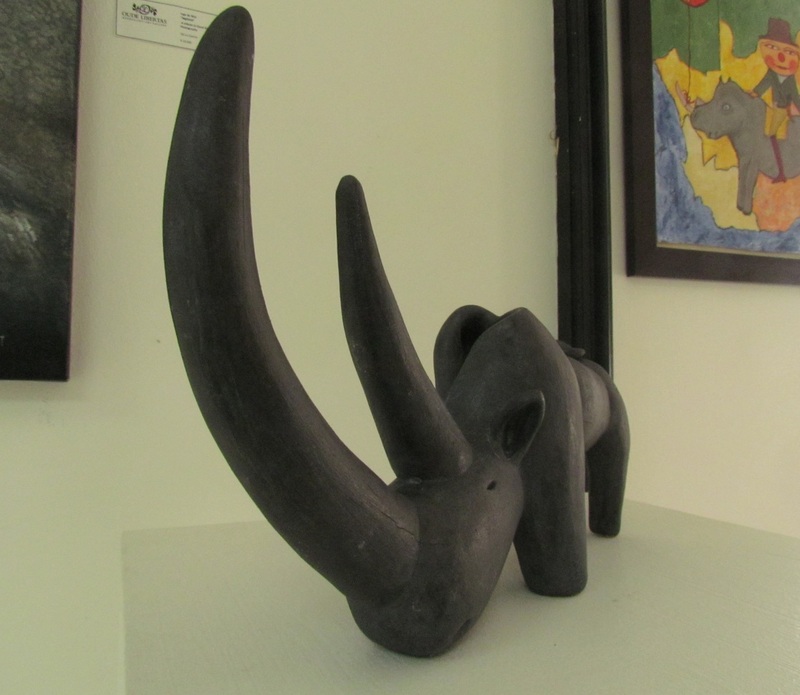 Sculptors and painters illustrated the impact that these rhino murders have on them. Through exposing the violence, greed and apathy of our race they hope to bring attention to our shortfalls, so we can be pro-active in preventing the genocide of this megalithic species. He referred to the trend that currently two rhinos are killed per day in South Africa, so every 12 hours a rhino goes down. In the broader Africa the large rhino population has declined by 90%. Black rhino in 1960 there was over 100 000 and today there’s about 2000. There are many reasons for this, but the fundamental reason is that there’s more and more people and we are in competition for the shrinking resources. And in this case also resources that are being used for other reasons. 80% of Africa’s population is still dependent on forests and we have a big impact on forests and vegetation. Africa is also the last frontier for oil, gas, mineral, timber. We see almost a repetition of this grab for resources happening currently – all over Africa. Especially your Asian countries are there first and foremost. It doesn’t mean the Americans or Europeans aren’t there, but there’s a lot of exploitation going on. He told the story of how Dr. Ian Player with Operation Rhino had saved the rhino from extinction once before between 1961 and 1972 growing their population from 100 to 19 000. But what’s happening now with our rhino population? In 2013 the latest statistics indicate 553 rhinos have been killed this year. So there is this incredible jump from 2008 and we need to try and understand the reasons for this. What kick started it was that a senior official in Vietnam who claimed he was cured from cancer because he used rhino horn. From that point the threat started. Unfortunately it is now also included in a fashionable concoction that they make in some of the Asian countries, especially Vietnam. Over there if you have a rhino cocktail, you really have arrived. So it’s become a fad as well. It’s not only for medicinal purposes – for the rich it’s a fashion drink and for the ill a wonder drug to cure basically everything. High blood pressure, fever, stomach aches, and so not as much as you think as an aphrodisiac – this is not its main purpose. This is a worrying trend and much needs to be done to stop that. “There are people out in the bush, the paramilitary patrols, with a gun trying to control the frontier. And there are many programmes where if you share information with the police, there are rewards and incentives for people who actually make arrests. For example in Mozambique if you catch a poacher, take him to court and he’s prosecuted there are excellent rewards. Large intelligence networks are gathering information behind the scenes. But awareness raising must never be under-estimated. There is a very famous basket ball player in China called Yau Ming – a big guy of 6ft5, who joined the cause against wildlife poaching. Last year alone, because of this superstar saying it’s bad to eat shark fin soup the importation dropped by 75% in one year. The people around the parks should also be made aware. He closed by saying that every visitor to the Parks and other contributions towards conservation helps – and hopefully all the stories which we publish also make a difference. We were moved by incredibly works of art who expressed the feelings of the artists. These are the voices of several artists who have moulded striking artworks, casting their message into a strong visual form. 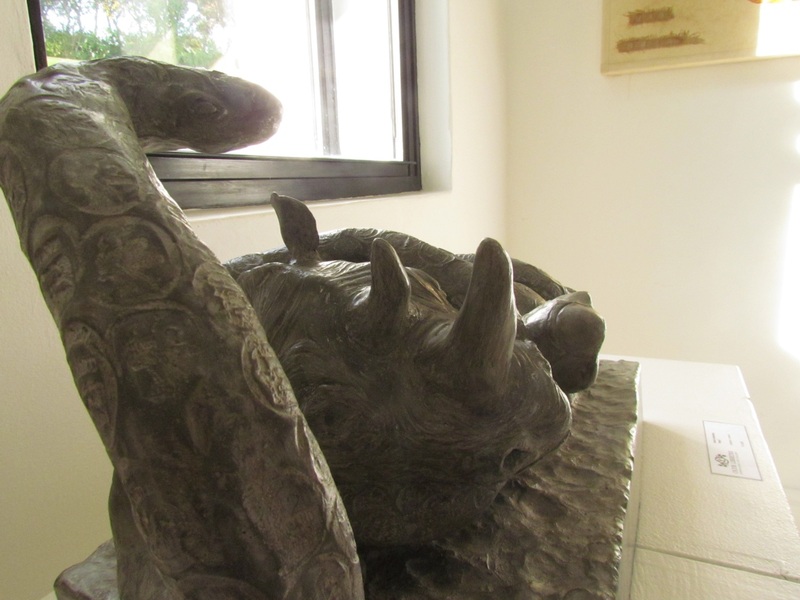 Nicolene’s background as a vet helped her to see how humans use animals for food, vaccines, medical research, cures and “ailments for human vanity.” Her sculpture, ‘Rhino’, dramatically exaggerates the size of the feature we attribute most to the rhinoceros: its horn. 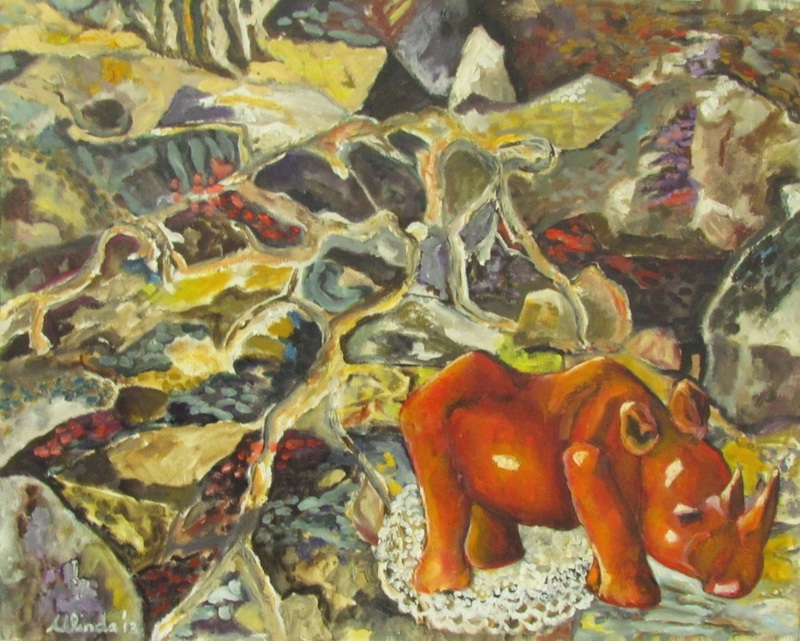 Adrienne chooses the expressionist approach to communicate a feeling of liberation for the Rhino and her calf in ‘Days of Freedom’. 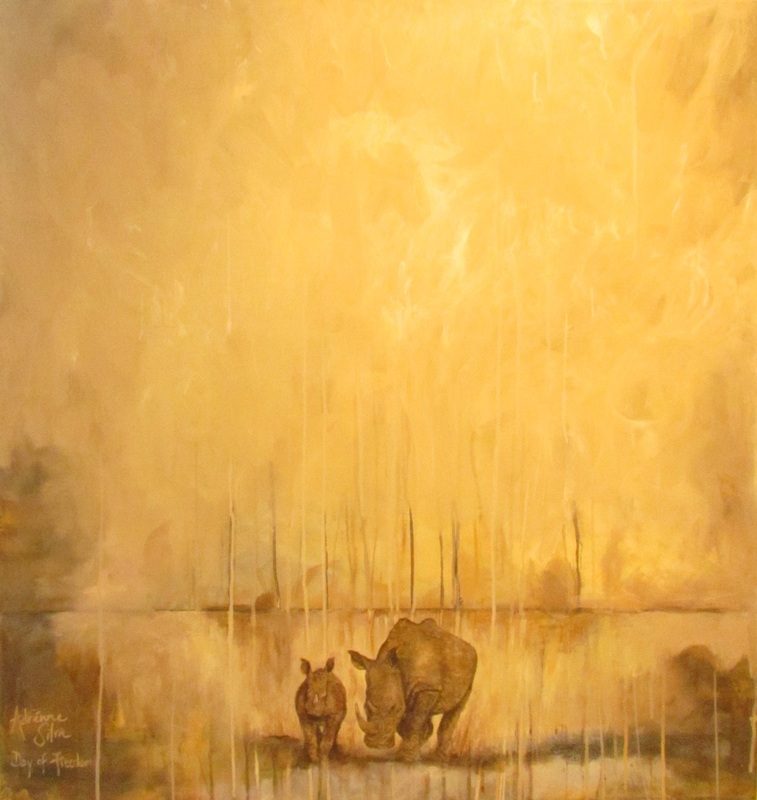 This artwork represents peace rather than violence, a glimpse into a world of how free the rhino’s should be. The light seemed to capture the mood in the bush. “I was inspired to complete this oil painting when I stumbled upon Tim Jackson’s photo of a Rhino and her calf,” Silva says. 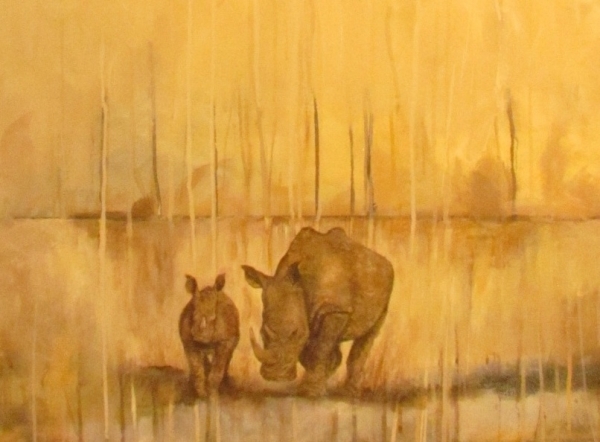 Annette shares a heartbreaking story of her experience working towards the Rhino Conservation exhibition to present her artwork ‘…a whiter shade of robust’. “When I heard about this exhibition I felt compelled to do a painting that would make the beholder stop and see a clear message! The image had to have a strong presence and I worked hard to portray the rugged, textured outside but yet to give a glimpse into the quiet but stately “inside” of this awesome beast. Elske’s rhino sculpture consists of two forms – a stylised rhino suspended above a boxed shaped container filled with sawn off rhino horns. The beautiful form of the rhino is celebrated and contrasted against the crude sight of amputed horns. The sculpture raises awareness of mans behaviour and attitude towards nature and each other, and can be ordered in resin or bronze. The exhibition is on until Saturday, 7 September. 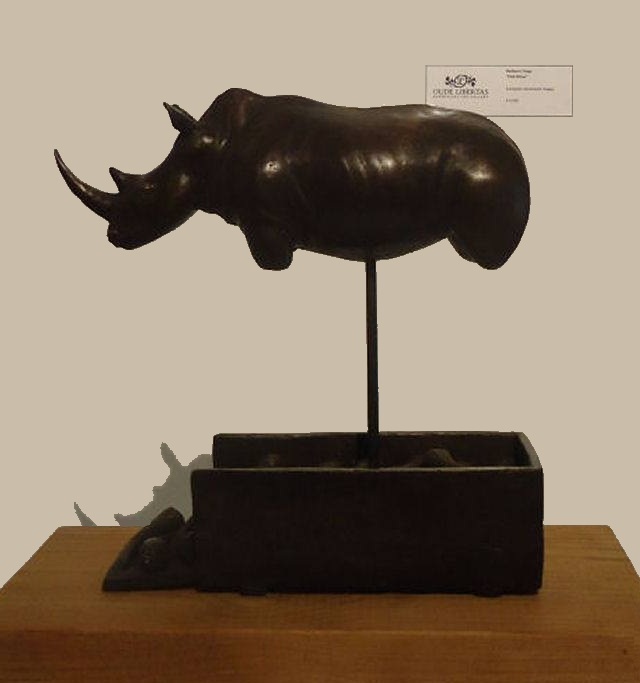 Les Sharpe, William Kentridge and Horste Klemm have kindly donated their works to the Rhino Foundation, should they sell during the exhibition. Take a drive out to this beautiful gallery and feast your eyes on art with an important message.